Abbott General Store was erected in 1880, at the northeast corner of Bloomfield. It served the town’s residents for a century. 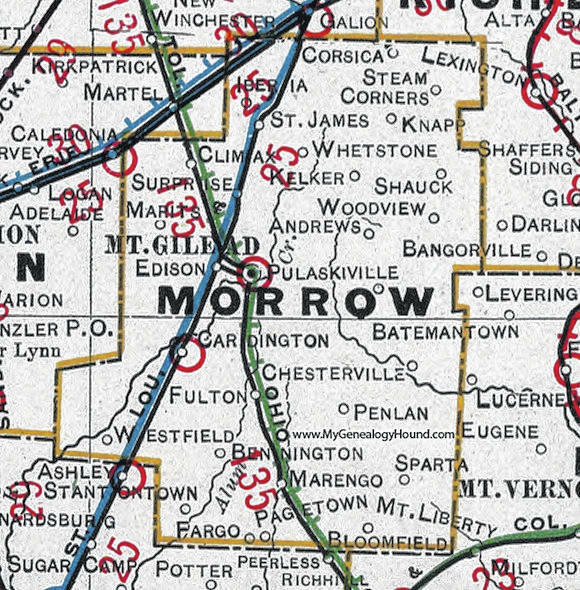 This 1901 map shows Surprise listed as a Morrow County village. Others were there that no longer exist more than a century later, now labeled as ghost towns. SURPRISE — Frederick “Fritz” Miller is old enough to recall when this place existed. Miller, 85, resides on County Road 30 near this Ghost Town, one of dozens in Morrow County that no longer can be found. “There was a post office there in the village,” he said. He also shared the story behind how the now-forgotten community in Washington Township got its name. So the town had a name. A 1901 county map shows Surprise and other spots that have long since disappeared. A Ghost Town is defined as an abandoned village, town or city, sometimes containing substantial visible remains. Miller said he was about 12 years old and still clearly remembers a cider mill and saw mill in the area north of Shaw Creek. The post office was located in the southeast quarter of Section 10, Washington Township. It was established April 19, 1888 and discontinued on Jan. 31, 1903, with local mail sent to Mount Gilead. An exact date of when Surprise ceased to be remains a mystery. Other places had similarly unique names and many with a colorful story behind it. Some contain a full description; others just sketchy notes or unverifiable tales. • Aaronsburg, South Bloomfield Township. No known remnants, it was platted in 1824 by Aaron Macomber who had a wood bowl making business with a turning machine run by horses. The town also had a wool hat shop owned by Hugh Hartshorn. The residential lots in Aaronsburg never sold and it was quickly abandoned. • Bartlett’s Corners (Elliott’s), Westfield Township. By 1991 all that remained was a single house. • Benedict Mills, Peru Township. The “plant” community had its first cabin built by Cyrus Benedict in 1810. This mill complex “operated successfully” for many years. • Bloomfield, South Bloomfield Township. It was platted in 1845 by Thomas C. Hickman with 13 lots. The first physician was Dr. McClernand in 1842. The first building was erected a year later, where William Kincade moved a stock of goods into this store. In 1847 the town had its first blacksmith, Robert Patton. A few years later John Millison became the town’s first undertaker. Marvin Lyon opened a shoe shop in 1862. Abbott General Store was erected in 1880, on the northeast corner. It served the residents for a century, closing in 1980. A barbershop operated in the back with Vay Campbell Wells. Remnants include a few houses and a cemetery. • Center Corners, Franklin Township. It had a round log school house built about 1820. The town had a marble works, operated by George Gunsaulus, who had a retail shop just south in Chesterville. By the late 1800s it was known as Franklin Corners. Today only a few houses remain in the area approaching the Knox County line. • Florida Grove, Franklin Township. History calls it a “paper town.” It was laid out prior to 1823 and a number of lots were sold. But the town failed by 1880 and was returned to farm land. • Friendsboro or Friendsborough, Gilead Township. The town began in 1822. Asa Mosher was very particular about who he sold lots to at that time. Mosher sold land to John Shaw to build a cabinet shop. When Shaw lacked the water for his business, the land reverted back to Mosher. • Jamestown, Franklin Township. It was laid out in the mid 1820s by James Bailey, who had a small store. Appleton Rich did blacksmith work. • Jugs Corner, Troy Township. Now the site of Mid Ohio Sports Car Course, this ghost town’s name has inspired two local legends. The first one is that there was a distillery in operation at Jugs Corner located up a long and often muddy lane. Rather than make the trip, patrons would leave their jugs at the end of the lane. The owner would take them back to the distillery and fill them, returning them to the end of the lane. A second version is not as colorful. It goes that a farmer used to keep a jug at the end of the field. After making each round, he would stop for a drink. • Kelker, Congress Township. Very little is known, but there was a post office set up on June 25, 1898. It was gone by early 1903. • Knapp, northeast quarter of the county, exact location unknown. It existed from 1895-1901, when the post office was discontinued and local mail moved to Lexington. • McEwen’s Crossroads, Troy Township. In December 1832, John McEwen established a post office at the crossroads of State Routes 97 and 314. A hotel and tavern were built along this busy roadway. About 1855, L. Lewis purchased the hotel. To promote the business he placed the horns of a buck deer above the entrance. From that day on, the site was known as the Buckhorn Tavern. As the tavern aged, it began to run down and its reputation went with it. Fights were as common as dances by the late 1860s. There were rumors of bodies buried in the basement. By the 1880s it was closed and sold as a private residence. The town’s last remnant was the abandoned Buckhorn School. • Morehouse Settlement, Peru Township. In 1830, Stephen Morehouse and his family settled here. There was a schoolhouse and most residents had the surname of Morehouse. Indians lived nearby and traded goods with the settlers. A deer would go for 25 cents per animal. James Morehouse operated a steam-powered sawmill for a few years. • Napoleon, Peru Township. For more than a century the town was lost to history. In 1935 a letter was discovered by the postmaster in Napoleon, which is in Henry County. It was learned that a Reuben Whipple operated as a carpenter. This was in 1821 and the town was part of Delaware County. A cemetery was there with several of Whipple’s descendants buried there. The town itself died officially 11 years after it started. That’s when Amos Andrews platted Napoleon on the Maumee River, 100 miles northwest of Whipple’s burg. • Patee Town (Breadless, Tyrone, Westfield), Westfield Township. Richard Helwig’s research is fascinating. It seems that travelers going through the wilds of southern Morrow County in the early 1800s stopped to find food. They would stop at a house, inquiring if they had any spare bread. At house after house they visited they were denied bread. Soon the community was referred to as Breadless. There was a tavern built by Edwin Patee. The town officially was laid out later, around 1829, when it became known as Tyrone. At this time Petty & Phillips began manufacturing fanning or mills. It employed 20-30 people. So, in an ironic twist, a town that began as Breadless became the maker of machines that were a vital part of the bread making business. • Port Miller, Washington Township. Another paper town. On March 25, 1852, Samuel and Nancy Jane Miller purchased a tract of land for $1,800, with 47 lots. The town was bounded on the east by the C.C. & C. Railroad. Besides the official plat record and 5 streets, there is no other mention of it. • Queen Settlement, Canaan Township. The town had a church & school and was founded by War Of 1812 veteran William Queen and Elizabeth Queen They were buried with relatives in Glendale Cemetery in Cardington. • Rome, South Bloomfield Township. A paper ghost own, it was surveyed in 1827 by Samuel Bryant. There are no other records of its existence. • Smailes, Harmony Township. At the intersection of Center Corners-Fredericktown Road and Williamsport-Blooming Grove Road. A post office was opened on Dec. 7, 1887. It was discontinued 7 years later. •Steiners Corners, Lincoln Township. Remnants are Asbury Cemetery on the south side of SR 529 west of the intersection and Buck Cemetery on the north side of SR 529. The town was founded by William and Marian Stiner. It had two saw mills (one steam-powered), a Methodist church and a school in the 1850s. William & Marian were buried with relatives in Asbury Cemetery. • Vail’s Crossroad (Five Corners), Bennington Township. Never officially recognized as a village, it boasted a tavern by 1839. An Adventist Church and … you guessed it … a post office followed in 1850. It was closed in 1873. By 1911, both the tavern and the church were gone too, leaving a crossroads and a few farmsteads. • West Point (Whetstone), Congress and North Bloomfield townships. In 1871 this town was home to J.R. Garverick & Co., dealers in dry goods, notions and hardware. A decade later it had a store, post office, church and school house. The post office closed after the turn of the century. • York, Washington Township. This town was likely founded in anticipation of the coming railroad, as were others in the county. Platted by Mary and Daniel Flint in March 1849, it consisted of 48 lots straddling the right of way of the proposed railroad. No other mention is made of York. Like most of the ghost towns in Morrow County they were there and then gone — with few details of their existence. Thank you to Stan Sipe and the Morrow County Genealogy Society and Dan Rhodebeck for their assistance. If anyone has information on any of the ghost towns, contact Conchel at 419-946-3010, extension 1806, or email aconchel@aimmediamidwest.com. More stories will be written as information emerges.